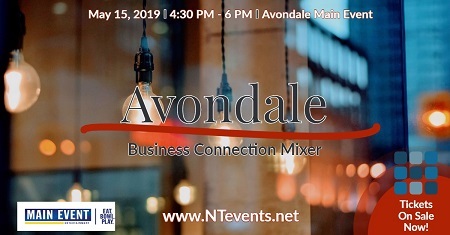 Come celebrate with like-minded business professionals from Avondale and across the valley by attending the May 15, 2019 Avondale Business Connection Mixer. Attend an evening of making new business connections, generating leads, and renewing existing business relationships that grow businesses. Keep up your energy with complimentary food, light refreshments, and music and enjoy a cocktail or soft drink from one of the cash bars. - 15 minute LIVE interview on May 9th with BeLIVE w/Network Together host Shawn Jones.